Time Warner CEO Jeff Bewkes made the case for his company to be acquired by AT&T as he took the stand on Wednesday in the antitrust trial over the proposed $85 billion merger. Fielding questions from lead AT&T and Time Warner attorney Daniel Petrocelli, Bewkes depicted Time Warner as a company that is quickly losing ground to tech giants. Those companies, Bewkes said, are swallowing up an ever-growing share of advertising dollars that used to go to television programmers like Time Warner and their Turner networks, which include CNN, TBS, TNT and others. And Bewkes said the likes of Google, Facebook and Amazon are able to exploit their technological supremacy to gain information on Time Warner's own customers that even Time Warner doesn't have. "They can offer more effective choices. They can recommended programming based on what you watch. They can sell you a better package," Bewkes said. "They have a lot of advantages." That has been one of the primary arguments made by AT&T as it defends the merger from the Justice Department in the first major antitrust trial since the late 1990s -- and the first time the department has sued to stop a vertical merger like this one since the 1970s. The Justice Department has argued that post-merger, AT&T would be able to use Turner content as leverage to extract higher prices from their competitors like cable, satellite or streaming TV services. That could lead to temporary "blackouts" when Turner content is pulled from those platforms, which could prompt customers to switch to AT&T. The government has also alleged that AT&T would prevent distributors from using Time Warner-owned HBO as a promotional tool and could coordinate with another vertically integrated media company, Comcast-NBCUniversal, to raise prices. But Bewkes called the government's theory "ridiculous," saying "It's not how this works." "[A blackout] is catastrophic, we lose a lot of money ... hundreds of millions of dollars," he said, noting that by going dark they lose subscriber fees from the distributor and the advertising revenue from commercials. Bewkes, who at one point ran HBO as CEO, also said it would not make sense for AT&T to prevent competitors from utilizing HBO, since HBO only makes money off of subscriber fees and relies on distributors to sell the channel as an upgrade. Bewkes described the "two big tectonic changes" he said have made the playing field more advantageous for Time Warner's new competitors. The first was the ability of companies like Netflix to go directly to consumers with its content, rather than through a wholesaler. That, Bewkes said, has been good for consumers, but it's made the environment challenging for Time Warner, which has traditionally reached consumers through wholesalers like a local cable company. Netflix, he said, has tons of information and data on its customers -- who they are, what they watch and how -- which can help Netflix determine what new content to create and what offers they can use to incentivize subscribers to stay. The other shift has come in what Bewkes described as a "major change in advertising." Digital platforms like Google and Facebook have allowed companies to get more sophisticated in their targeting of consumers, which is far more preferable to advertisers than the less-targeted advertising offered on TV. "They can sell a Chevy ad just to people who are trying to buy a car," Bewkes said. The result is that companies are "moving away from television advertising in general." Bewkes claimed that Time Warner doesn't have the engineers or technology platform to keep up with a company like Google, which he said is "taking the lion's share of advertising." The testimony from Bewkes marked a pivotal juncture of the trial, which started last month. Randall Stephenson, the CEO of AT&T, is expected to testify on Thursday. AT&T announced its intention to acquire Time Warner and its robust content portfolio back in October 2016. Shortly thereafter, Bewkes said he would step down after the deal closed. But the Justice Department threw a wrench in those plans when it sued to block AT&T's bid in November of last year. Over the last four weeks, lawyers for the government have argued that AT&T would use Time Warner content to exert unfair leverage over its competitors in the pay TV arena in an effort to draw consumers to DirecTV, which is owned by the telecommunications giant. Bewkes said he never discussed the idea of using Turner content as leverage to benefit AT&T while planning the merger with Stephenson or any other AT&T representative. "I think we need competition," Bewkes said Wednesday, adding that he believes leveling the playing field with Google, Amazon and Facebook would be good for consumers. Bewkes tangled with government attorney Claude Scott on cross examination, saying he was misinterpreting the state of the industry and Time Warner's data. Scott used internal Time Warner reports to show that its revenue has actually gone slightly up in recent years, indicating that the company was not in such dire straits as it competes with the newer technology companies. But Bewkes said that when accounting for inflation, the revenue was actually flat. 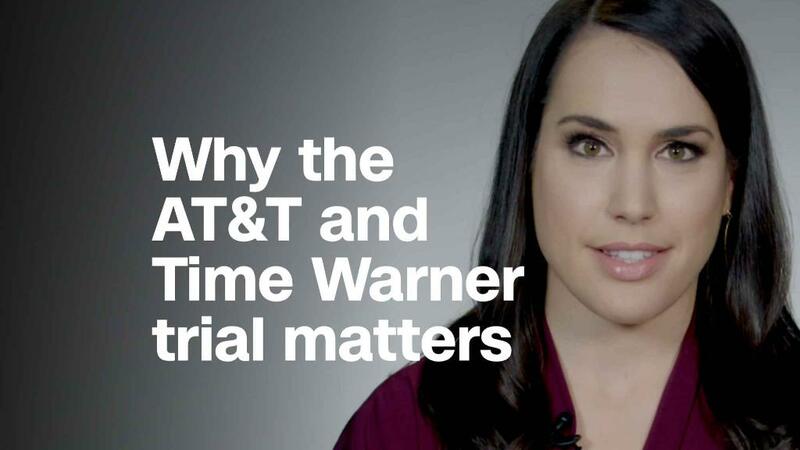 Scott also pointed out as a merged entity, Comcast and NBCUniversal theoretically have the type of customer data Time Warner is seeking from AT&T, since Comcast is a distributor paired with a content provider. But Scott said their revenue declined slightly even after the two merged. "I don't know what [customer] data they have," he said. "I compete with them. I don't run their company." When Scott showed a chart of total global advertising revenue across several companies and pointed out that 85% of Google's advertising revenue is from search advertising and not video advertising like that of Time Warner, Bewkes accused Scott of "making a false silo." Bewkes said Scott was missing the bigger picture -- that in today's world the "competition for advertising isn't just about television." "If digital advertisers are able to target consumers with messages delivered through search or other ways, that takes away from television," he said. Next on the stand was John Stankey, AT&T's Senior Executive Vice President in charge of the Time Warner merger integration planning. During direct questioning by Petrocelli, Stankey, who has been in court every day during the trial, reiterated many of the points Bewkes brought up in his testimony, saying that AT&T is competing with companies like Facebook and Netflix for consumers' "time and attention." "We don't do programming and content at AT&T, and as Mr. Bewkes said, they can't see what the people are watching," Stankey said. He also contended that the merger could benefit consumers in that AT&T could offer higher-resolution television by controlling how content is produced and shot. And Stankey was dismissive of the government's charges that AT&T could withhold Turner content, or that the company could collude with Comcast to gain control over the market. "I don't like Comcast. I've been competing with them for years," he said. "I'm not going to cooperate with someone I don't like." Stankey's cross-examination dealt extensively with sealed documents detailing what he stands to earn if the deal goes through; those figures were not mentioned explicitly in questioning. At one point, government attorney Eric Welsh tried to poke holes in Stankey's bullish projections for the AT&T-Time Warner merger. When AT&T acquired DirecTV, Welsh said, Stankey predicted the company would gain more pay TV subscribers through bundling; Stankey acknowledged that AT&T fell short of that. A long day of court ended at 6:30 p.m., with Stankey's cross-examination set to resume on Thursday morning.